The evidence is clear: we trust people and we don’t trust marketing. We often reach out to our network first before we go near Google. We ask them for recommendations on which tradespeople or gardener to use. Or which car we should buy or the real estate agent we should use to sell our house. We listen to our friends and family as trusted advisors more than any glossy ad, website or brochure. That’s what makes them influential. So why haven’t we become students of influence when it’s proven to be so effective? Why do we persist with conventional marketing and advertising or join the stampede to pay per click (PPC) or targeted ads? The problem is a human one. All these things represent a quick fix. And with anything in life, quick fixes means everyone’s into them. Important, meaningful things like getting fit, obtaining a new qualification or having a successful personal relationship, take time and effort. There are no short cuts. Yet many people and marketers are not willing to apply themselves and play the long game. They want instant results or tick the marketing boxes. Building relationships with key influencers, just as it is with the best customers, takes a ton of application and effort. You rarely get the sale on the first date. When you build a relationship that is based on selfless acts along with a genuine and sincere intent, rather than pursuing your own self-serving motives, it creates trust. And trust is the currency you need if you are to stand any chance of making a sale. Yet so few brand marketers and sales teams use influence to do help them achieve this. Word of mouth is the purest form of marketing because it is highly personalised, targeted and comes from the most persuasive, trusted source. The very same attributes we as marketers and brands long for. 2. Sniper, not shot gun. This is because not all influencers are equal. We map key influencers in each farming region. We even role and rank them so we can prioritise efforts and resources against the targets we set ourselves. Then we put a plan in place to convert detractors whilst maintaining and growing a larger base of loyal advocates who we know will publicly endorse and promote our brand - without paying them. It’s not rocket science. You should do the same if you want to reduce sales cycles and cost to acquire. Word of mouth has always described as “the best form of advertising”. Whilst an absolute claim (because talking in absolutes can be dangerous), it’s true because referrals and reputation are all we have as people or brands. And most of us, despite public protests, care deeply about what others think and feel about us. The answer is yes you need to more but influence, or word of mouth marketing, is the most effective tool you can have in your marketing armoury and will give you the biggest bang for your buck. The statistics at the start of this article back it up (Google more if you still don’t believe me). Despite all the compelling evidence, it still astounds me why so many companies and their sales team fail too grasp influence as a key marketing discipline. They should be masters in the art of influence. When companies sell to us instead of serve us we know they have their commercial interests at heart, not ours. This explains why consumers tune out so much and ignore the majority of marketing messages. I purposely don’t click on paid google ads because I don’t like to reward companies who think they can pay their way to the top and buy my click. I prefer companies to earn their ranking through useful, relevant and valuable content. Paid ads signal to me that the sponsoring brand is happy to cheat the system. It doesn’t feel natural. I suppose that’s why they call it organic. The use of money cheapens its appeal, as it is with influencers. If you have to pay someone to promote your brand then you’ve failed to make your product or service stand for something. The value then becomes the money, not the brand. If you can create a brand that people will happily and willingly promote without financial reimbursement for free then you’re well on your way. This is why “influencer marketing” can have such a bad name. The money exchange blurs the lines and customers see right through it. Up to 30% of all internet users are using ad blockers. 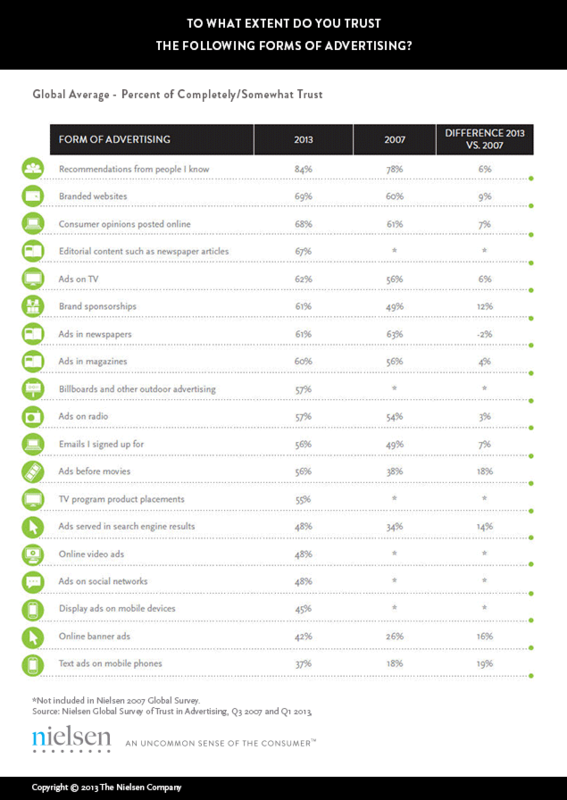 There’s also a rise in ad blindness among both millennials and Gen Xers. Less than 10% of people actually click on paid ads. That's right, around 94% of all search traffic goes to organic results over paid ads. Any company that is using or advising you on PPC (pay per click) advertising has it wrong. Research shows that 70-80% of search engine users ignore paid ads and only focus on organic results. It’s because they are viewed as more authentic and natural. Organic rather than manufactured. Only a few days ago I voluntarily paid for AdBlocker to help me keep my screen clean. I accept some sites need to advertise to generate content (like Forbes) but some sites I am happy to pay a small subscription for (like Medium). AdBlockers are be standard in Apple’s new iOS systems and are in the top 10 of app downloads in App Store. If marketing and advertising was so effective, why do we and companies like Apple use ad blockers? Everywhere you look, we’re block out ads because they’re noisy and irrelevant. Pre-recorded programmes like MySky allow us to fast forwarding through the ads. The reason why so many companies hack the system is because paying for clicks is the easy, quick, lazy option. Earning engagement through regular, disciplined and relevant content is much much harder. It’s a longer game but many of us don’t have the time for that. We want instant results and instant gratification instead. Humans are suckers at opting for the quick buck. What we forget is there’s the far greater prize of honour and respect for people and brands that “do the hard yards” instead. Because they’ve done it naturally through hard work, tenacity, grit and graft we’re more likely to warm to them and trust more. The reward comes in the end but you have to be consistent and remain committed. Pay day will come but it never comes quickly. Be a hard yards person or brand. Your influence will be far greater. I always love it when this question comes up. It’s very nature confirms the power influence wields. We ask some of the world’s most famous, and therefore most influential, to ask who and what influences them most so we can hope in baited breath to work out their formula and see if their influences can influence us in the same way. When people are asked who was the greatest influence on their lives you know their answer is going to be powerful. They will describe the affect a person had on them. Sometimes it might be their parents. Or a teacher. Or a professor. Maybe even a boss. Richard Branson quotes his mum, his WWII pilot uncle and Sir Freddie Laker. For Oprah is was Nelson Mandela. Warren Buffett talks about his mate Bill Gates. Elon Musk even claims it’s Kanye West (Wow!). Influence affects everyone. Anyone that suggests they are immune to influence is talking crap. We all are. The influence of money, a good school, a teacher, a sport hero or a bad crowd. We’re all been influenced by someone or something all the time. That influence is often conscious but most of the time it’s subconscious. The hidden influencers like conformity bias where we need to need to fit in and belong as a crowd for survival. He argues as humans we’re defenceless against such weapons. We respond to them unknowingly with what he describes as a “click and whirr” using 35 years of social science to back it up. They are simple proven concepts to grasp and apply for any marketing team. It’s a must read (and one of the best business books I have read so I can’t recommend it enough). The best way marketers can do this is by committing to their very own Influencer Strategy so they can make more raving fans and advocates of their brand. I don’t mean millennials on Instagram with 000s of fake bot followers. I mean real people that you’ve done your homework on. People that you know what they stand for and can move the needle for your business. People will publicly stand up and vouch for your brand because they believe in it. A few years back, Dairy NZ commissioned a sociologist to map out key influencers or “alpha farmers” in all the dairy regions of New Zealand. I imagine the catalyst was to find out how they could use to influencers to influence best practice amongst other dairy farmers. Any rural company with a decent database of customers should be able to work out roughly the same. In farmer panels, we always ask participants to role and rank influencers - both the people and channels. That way we find out which ones they trust and associate most credibility with so we can target our messages and marketing dollars more efficiently and effectively. The clients that sit with me on these panels hear this stuff too so there’s no risk of misinterpretation. In rural, we know veterinarians are key when it comes to animal health and geneticists for breeding programmes. Farming women are top of the list - finally (doh!) - yet many still ignore their under-estimated influence on farm purchases. Bankers and accountants aren’t as high up the list as you think. The surprise one is often stock agents who still seem to have strong personal relationships with their farming customers through the personal connections they make. What’s the relationship health score that we have with key influencers? How well do we know them? Where do they live? What media do they consume? What are their individual needs and drivers? How well are we meeting these? How are we tracking and measuring them as detractors or advocates? What are our plans and strategies to convert detractors into advocates? The better we know these key influencers the more we can sell. Or we can carry on blindly, hoping things and sales will improve (when I last looked hope was never a strategy). I don’t listen to Radio Sport much because talk back has never made me smarter (I listen to Radio New Zealand instead). However Mark Watson, an outspoken Radio Sport commentator, was a very public detractor of Team NZ in its past campaigns. However the last defence he became a massive advocate. So what happened? Team NZ targeted him as an active, public detractor and set to turn him into a positive advocate. They did this by giving him complete access to the internal workings of the cup campaign and their team camp. By doing so he better understood what they were about and what they stood for. More importantly, they made him like an insider. And ever since he’s had nothing but great things to say about what they do and how they do it. Who do you have as detractors? What could you do to get them on side with your brand? Landcorp did it with environmentalist Mike Joy and long term farming critic Alison Dewes. It’s a good playbook to follow. Marketing today seems forced whilst influence seems more human and natural. It’s about pull rather than the push. Trusted vs. distorted. Personalised vs obtrusive. It’s far more powerful for a customer to reach out pre-qualifying themselves than you having to barge into their world via a “page take-over” - what a bloody awful term! Social studies and MRI scans have shown people’s cortisol rise when the content or video you’re viewing is interrupted. This is the desperate level marketers have stooped to and it doesn’t do our profession any good. How does it feel to have your viewing or reading experience interrupted? Does it make you feel attracted or closer to the brand in question? It doesn’t for me. And I doubt it for you. So how can you influence people in a good, positive way? The other way is to offer a great customer experience and service. Go the extra mile. Map the customer journey with your team and exceed their expectations. Some companies go out of their way to fix things knowing the reward is a multiple payback with aggrieved customers becoming life long ambassadors for their brands. They see it as an opportunity. Word of Mouth or Word of Mouse? The Fay Research Group worked out that only 7% of world of mouth happens online. We still spend 8x of our time offline. What are they saying about your brand? To give yourself the best chance you need to make sure they are saying good thing about your brand based on great service and customer experience. As marketeers we have less control and influence over our brand story. We like to think we control our brands when in fact it’s our customers that control the narrative. They experiences are the stories they tell. The customers that feel an ownership of the brands they buy (Nike, Apple, Virgin, Apple, Harley Davidon) are always the most powerful. Nowadays we need to find ways in which we can influence the way our stories are told by others rather than trying to being the gatekeeper. That role has long gone with social media alone. This has to be one of the best influence campaigns for an important public health cause I’ve ever seen. The influencer casting using children to approach smoking adults for a light is pure bloody genius. However influence can come in both positive and negative forms. As humans we tend to have a bias for the the former and not think enough about the latter. We are likely to tell twice as many people about a negative experience than a positive one. A positive experience is only transmitted to 4-6 people. When you felt aggrieved or put out by bad service, or maybe you got cut off on your commute to work, you feel much better if you let it out and share your story or experience with someone you know. You offload on your friend, family or work colleague who will normally empathise with and say “poor you” (or if they’re good friends they might even challenge you if they think you got it wrong?). You then move on with your day feeling that bit better. Same for a rant online review or threatening to report them to Fair Go or Consumer. We don’t talk about positive experiences as much because they don’t have the same impact. They don’t affect our feelings in the same way. However news, the good and bad, still travels so we have to do our best to influence how it is told. Another form of influence is the company you choose to keep. Jim Rohn claimed you’re a product of the five people you hang out with most. Social pyschologist Dr David McClelland of Harvard published research that suggested your “reference group” determines as much as 95% of your success or failure in life. Another study proves if your friends are overweight you are 57% as likely to be overweight too. It seems it pays to choose your the people you associate with most wisely. The other input or influence is the information you expose yourself to. What media and content you consume? Is it influencing you in a good or bad way? I made a decision years ago to only read books that made me better and more effective in life and business. I’m still a massive work in progress (believe me!) but I do have faith that there is a long term compound payoff (I just know it won’t be an overnight thing). On a personal level, think about how you can positively influence someone in your life. How can you make them be a better version of themselves? What can you do to support them? (for me, it’s come from being involved as a Trustee and Mentor with Big Brother, a fatherless youth charity. I have a busy life but get the joy from mentoring knowing I’m making a difference). So how do you become more influential? Influence comes in many forms. Most of us as people or brands want to be influential. We want to matter and make a difference. We want others to take notice of what we say or do. So how you go about that? Don’t try to sell. Be of service instead. Make your content useful, interesting and valuable. Don’t write about how amazing you and your products are or post some humble brags that everyone can see through (my LinkedIn wall is full of them). That’s what we call “We” language. Use “Me” language instead and write about how you can help your customers. Give them something they can use and apply: news they can use. ps: if you want to create your own Influencer Strategy specific to your rural business please contact me. I will take you through a proven 5 step framework that delivers shorter sales cycles at lower cost to acquire. More marketers need to be masters of influence. Let me help you do that.